We are nine months into 2014 and the heat records continue to fall globally. January-September tied with 1998 as the warmest such period on record. For global average temperatures over land and sea, this September was the highest for the month since record keeping began according to the U.S. National Oceanic and Atmospheric Administration. It is the 38th consecutive September above the 20th Century average. You need to go back to 1976 for below average temperatures for September. January March and April were among the four warmest of those months on record, and May, June, August and September all set new global average temperatures records. High ocean surface temperatures have assisted in this record warmth with El Nino still possible to develop if there is sufficient atmosphere - ocean coupling. The average land surface temperature globally was the sixth highest on record for September at 0.89°C (1.60°F) above the 20th century average of 12.0°C (53.6°F). Warmer-than-average temperatures were experienced over most of the land surface, except for central Russia and some areas in eastern and northern Canada, according to NOAA: "Record warmth was notable in much of northwestern Africa, coastal regions of southeastern South America, southwestern Australia, parts of the Middle East, and regions of southeastern Asia. In total, 31 countries and territories from all seven continents around the world had at least one station that reported record warmth. The period of record varies for each reporting station." "September temperatures were above average across Australia, with daily high temperatures responsible for much of the warmth. The September average maximum temperature for the country was 2.03°C (3.7°F) higher than the 1961–1990 average, the fifth highest maximum temperature for the month since national records began in 1910. The state of Western Australia was record warm, at 2.75°C (4.95°F) above average, breaking the previous record set in 1980 by 0.44°C (0.79°F). Tasmania reported its second highest September maximum temperature on record and Victoria reported its seventh highest." 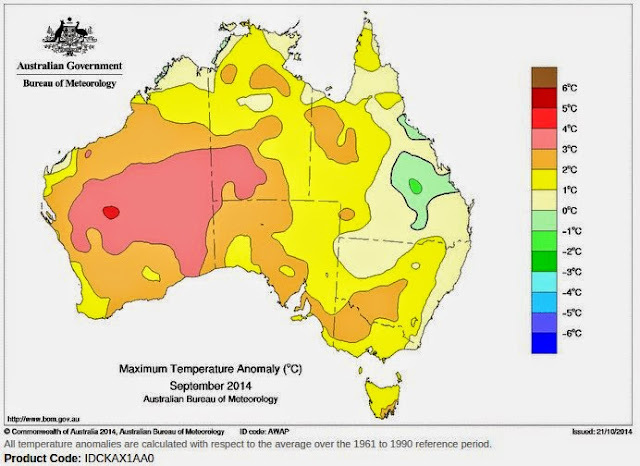 Here is the mapping from BOM showing the Maximum temperature anomaly for September 2014 for Australia. Rainfall averaged across Australia during September was 27% below the long-term mean. "The Northern Territory, Kimberley, the east of Western Australia and much of northern Queensland recorded below-average monthly rainfall. The Northern Territory recorded the largest departure from mean with rainfall 99% below average for their fourth-lowest September rainfall, although totals are typically low at this time of the year during the 'build up'. Rainfall was also below average for western and southern South Australia, Tasmania, most of Victoria and much of eastern New South Wales. For parts of southeastern South Australia, western Victoria and Tasmania rainfall was in the lowest 10% of records for the month to lowest on record for an area of Victoria around and north of Colac." the Bureau of Meteorology said in the monthly summary for September. @takvera I notice there is a whole lot of food grown in that brown area. All the farmers are saying it's too hot and no water already. The average September temperature for the global oceans was record high for the month, at 0.66°C (1.19°F) above the 20th century average, the highest on record for September. This also marked the highest departure from average for any month since records began in 1880, breaking the previous record of 0.65°C (1.17°F) set just one month earlier in August. This is the third time in 2014 this all-time monthly high temperature record has been broken. Record warmth was observed in parts of every major ocean basin, particularly notable in the northeastern and equatorial Pacific Ocean. Although El Niño conditions were not officially present across the central and eastern equatorial Pacific Ocean during September, NOAA's Climate Prediction Center favors El Niño to begin in the next one to two months and last into the Northern Hemisphere spring 2015. If the remaining months we experience average or above temperatures, then 2014 is on track to set the warmest year on record.